For most kids, bath time actually means play time! From rubber duckies to mermaids, the bath is a fun place to let kids’ imagination run wild. 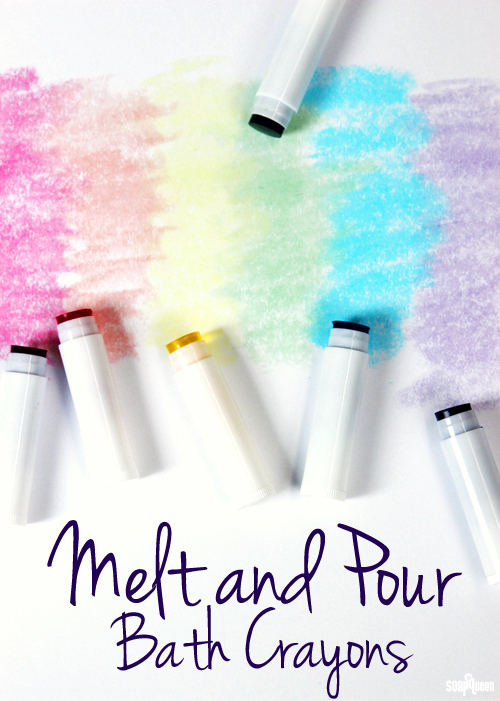 These Melt and Pour Bath Crayons give kiddos another way to get creative in the tub. Made with melt and pour soap and LabColors, these crayons are perfect for doodling in the shower and tub. They even work great on paper! This tutorial creates three sets of six colors: red, orange, yellow, green, blue and purple. Each tube uses undiluted LabColor to give intense color, so no need to dilute! 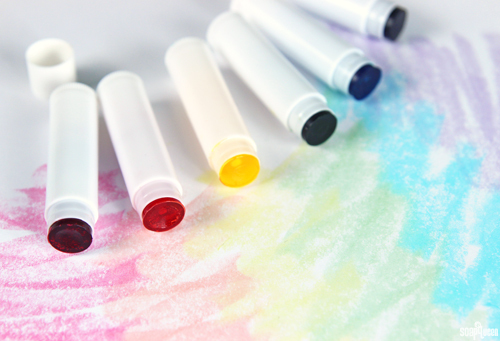 A simple and quick project, these crayons wash away easily from the tub. To be on the safe side, test the soap crayons in a discrete area on your tub before unleashing your child’s creativity. ONE: In a heat-safe container, melt the clear melt and pour in the microwave using 10 second bursts. Add 3 mL of White Tea and Ginger Fragrance Oil, and stir to thoroughly combine. If using the Lip Balm Pouring Tray, insert the lip balm tubes into the tray. We found the tray made it much easier to pour the soap! TWO: Pour .6 oz. 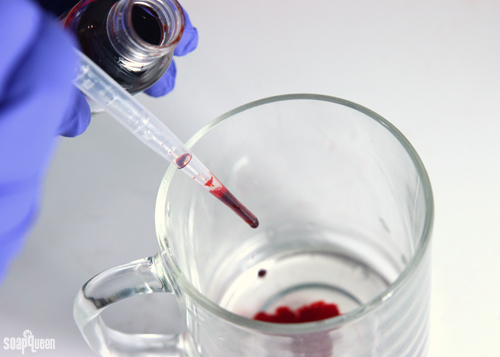 of the melted soap into a small container, and add 1 mL of undiluted Red LabColor. Use a spoon to thoroughly mix in the color. If necessary, place the container into the microwave using 2 second bursts to reheat the soap, making it easier to pour.Pour soap into three lip balm tubes and spray the tops with 99% isopropyl alcohol to disperse any bubbles. THREE: Pour .6 oz. of the melted soap into a small container, and add 1 mL of undiluted Orange LabColor. Use a spoon to thoroughly mix in the color. If necessary, place the container into the microwave using 2 second bursts to reheat the soap, making it easier to pour. Pour soap into the three lip balm tubes and spray the tops with 99% isopropyl alcohol to disperse any bubbles. FOUR: Repeat the process with the yellow, green and blue colors. If necessary, reheat the melt and pour in the microwave using 2 second bursts. FIVE: When making the purple hue, we found the best results came from mixing the Red LabColor with the Brilliant Blue LabColor. To achieve our purple hue, we mixed 3 drops Brilliant Blue LabColor with 7 drops Red LabColor using the Droppers with Suction Bulb. Stir to fully combine the colors, and pour into three lip balm tubes. SIX: Allow the soap to fully cool and harden, for approximately 30 minutes. Remove from the tray, and enjoy! 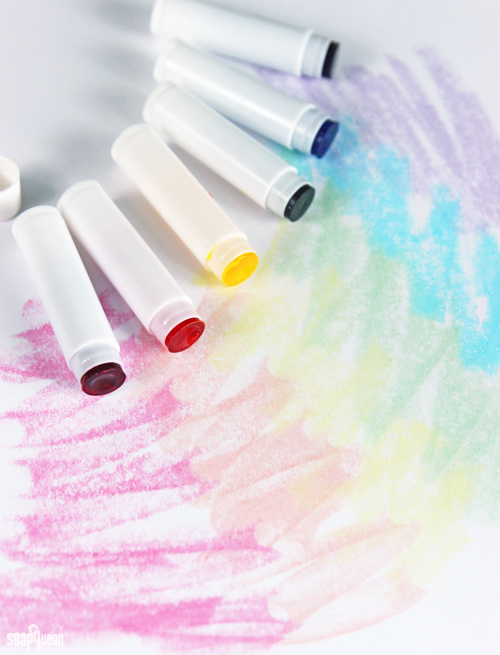 These fun crayons are perfect for drawing on the tub and shower walls! In a heatsafe container, melt the clear melt and pour in the microwave using 15 second bursts. 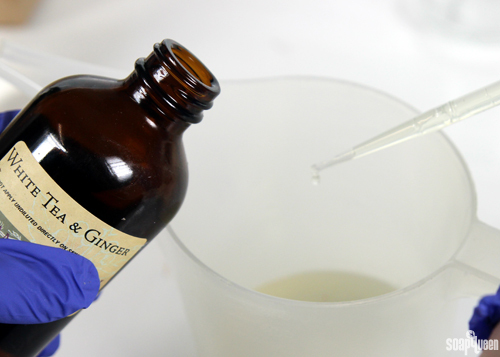 Add 3 mL of White Tea and Ginger Fragrance Oil, and stir to thoroughly combine. Pour .6 oz. 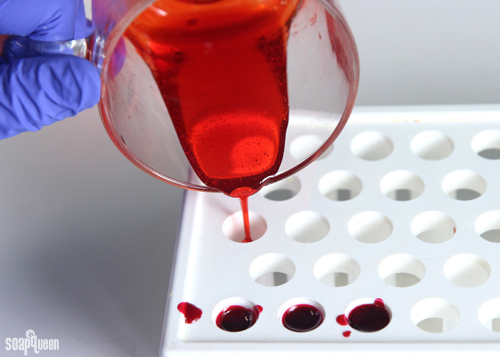 of the melted soap into a small container, and add 1 mL of Red LabColor. Use a spoon to thoroughly mix in the color. Pour soap into three lip balm tubes and spray the tops with 99% isopropyl alcohol to disperse any bubbles. If necessary, place the container into the microwave using 2 second bursts to reheat the soap, making it easier to pour. Pour .6 oz. of the melted soap into a small container, and add 1 mL of the Orange LabColor. Use a spoon to thoroughly mix in the color. Pour soap into the three lip balm tubes and spray the tops with 99% isopropyl alcohol to disperse any bubbles. Repeat the process with the yellow, green and blue colors. If necessary, reheat the melt and pour in the microwave using 2 second bursts. 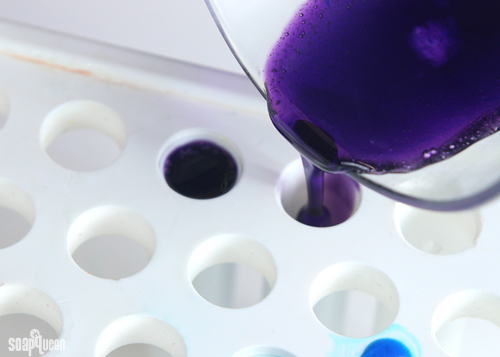 When making the purple hue, we found the best results came from mixing the Red LabColor with the Brilliant Blue LabColor. To achieve our purple hue, we mixed 3 drops Brilliant Blue LabColor with 7 drops Red LabColor using the Droppers with Suction Bulb. Stir to fully combine the colors, and pour into three lip balms tubes. I recently tried making bath crayons. They color amazing, but I’ve been having some problems with the tubes. Everything was going great until I noticed that some of the soap leaked down into the bottom of the tube. It ruined their appearance, but they still worked. Once the soap hardened, the tubes either wouldn’t turn, or they turned and nothing happened. Any suggestions? What am I doing wrong? Love this. I don’t have LabColors. Can Mica’s and Oxides be used at all? If so, how much? Thanks. I used the Canary Yellow Lab Color, but my soap crayons look green instead of the yellow yours are. Any ideas why? I’m not entirely sure why that’s happening! The Canary LabColor doesn’t have any green undertones that I can see. Are you using the Clear Melt and Pour Base? Would it be possible to do this with cold process soap? I would love to do it with goat’s milk cold process soap. I ordered some supplies to make these. I think they are the perfect addition to my product line! I do not want to label the tubes individually because I think the labels would not stay on and the ink would come off. What are some great ways to package these? One idea I had was to get different colored lip balm tube tops so you can know which color is what and putting them in organza bags but I will probably have to stick a paper in there with the ingredients. Wondering what others have done with packaging these! Thanks. You could also sell the crayons in a pack and include the label there. You could put them in a cute box or clear baggie. Either way would look awesome! 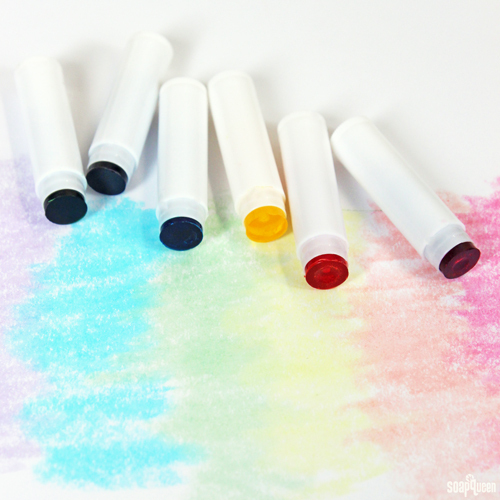 clear lip balm tubes would allow you to not only see the color, but to know how much is left. Is fragrance really needed? If you left it out, would you need to add something else to substitute? I wondering, could I use food coloring instead of LabColor? Would this be safe for a 2 year old and would it wash off the tub easily? I wouldn’t recommend using food coloring for this project. Food coloring is not intended for use in soap, so it can do weird things in your soap. It may take a lot of color to get the crayons to write, and because of that it may make the soap quite soft or watery. I have never used LabColors before. Will it stain grout? The walls around are tub are tile. Could you use a Shea or other white melt and pour instead of the clear to look more like a crayon? Hi, I tried making this with liquid glycerin and it didn’t work. Do you know why? I colored the glycerin just like you did, and poured it in. The only thing I did differently than you was I used the liquid glycerin that you get in a bottle. Please help. Hi, I tried making this with liquid glycerin and it won’t harden. Do you know why? I colored the glycerin just like you did, and poured it in. The only thing I did differently than you was I used the liquid glycerin that you get in a bottle. Please help. These Home made ideas are extremely impressive. Keep doing what your doing. 1. Why did you choose that scent? 2. Can these be used on paper? My mom and i made the bath crayons today and they realy work i realy liked the blue crayon and the yelow is pretty nice. The green realy shines. Thank you for sharing this recipe with us. What a great project! 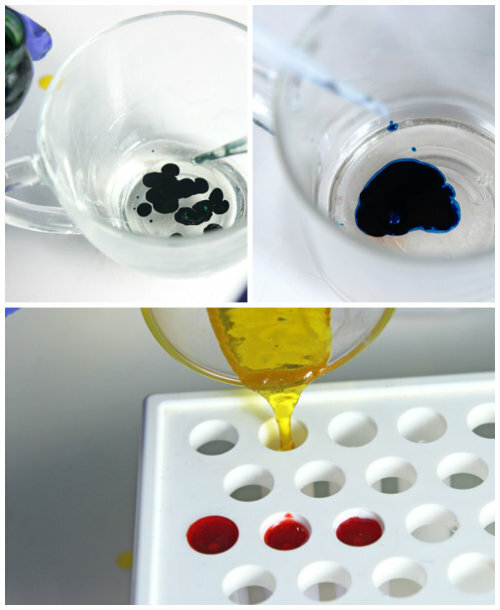 Do you think that using Melt and Pour Color Blocks in this recipe would work as well as the Lab Colors do? Thanks! Has anyone priced these out at all? I absolutely love them, and want to make them to sell and as gifts, but it’s hard to price out with the Lab Colors. You are so welcome, glad you like the recipe! I tried making these and everything was going well until the soap fully hardened. The tubes won’t turn to lift the soap like they should. Any suggestions? Will this work in a mold rather than the lip balm tubes? I had so much fun making these with my daughter. She couldn’t wait to take a bath afterwards. The green, orange and yellow didn’t color as much as I would have liked. If I remake them, would it help to add more of the Lab color? This recipe is awesome, and I really want to try it, but at the moment I don’t have any LabColours. Would this recipe work with water soluble soap safe dye? We didn’t try this with the dye you’re referring to, so I’m not 100% sure! 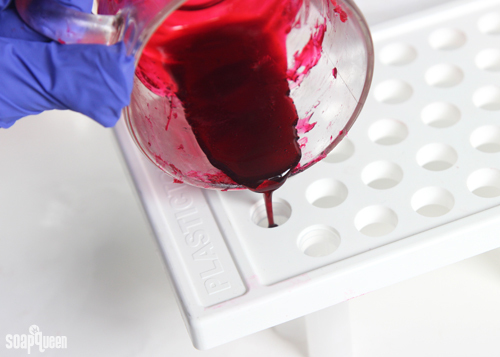 We recommend using LabColors for those recipe. We’ve found they’re the best colors for writing on tub walls! I put this in my children’s Christmas stockings and they used them in their bath tonight. They had a blast playing with them. Will the dye colour the tub and hard to wash off? Could this be made using Micas instead of labcolors? I love this! I’ve had people ask me in the past if I had soap that would actually “colour” and now I can make it for them. Can this be done with already diluted Lab colors? Any idea how much you would need to use? We used undiluted LabColors because they give you a great color saturation without adding too much water. Using diluted colors won’t give you the color saturation needed to write on the tub, so we don’t recommend using them. Hope that helps!